New York Mets manager Terry Collins has set his rotation for the World Series, and there are some surprises. Adam Rubin of ESPN New York had this comment from Collins on why Harvey got the call in Game 1: "He was next in line to pitch against the Chicago Cubs when the Mets swept the National League Championship Series." There are a few reasons I don’t like the Mets’ direction here. If the Series goes seven games, Harvey would get games 1 and 5, deGrom 2 and 6, and Syndergaard 3 and 7. If Harvey keeps averaging what he has in his postseason starts, he’ll reach 214 innings for the season after Game 5. That number blows away what Scott Boras wanted (180 innings) and even what the Mets planned for Harvey before the season started (190-200). Regardless of what the Mets and Harvey say, that very likely eliminates Harvey for relief in a potential Game 7. That would not be the case for deGrom, who should be clear for Game 7 relief. Madison Bumgarner showed us how valuable that can be. I also really liked what the Mets did in both the NLDS and NLCS, and that was staggering deGrom and Harvey with their rookies Syndergaard and Matz. The same approach works for me because Syndergaard and Matz did not go particularly deep in their postseason starts. Middle relief is the one big question mark on the Mets pitching staff, and with Matz and Syndergaard going on consecutive days in this series, leaning on that middle relief is a reasonable possibility in both of those games. You lessen the potential strain on that middle relief by splitting Matz and Syndergaard. And finally, deGrom has been the Mets’ best starting pitcher in 2015. It was close between him and Harvey, very close, but the edge goes to deGrom for me because of their K rates: 27.3 percent vs. 24.9 percent. DeGrom also has also been better in the postseason. He deserves to pitch Game 1 and because of the potential Game 7 relief possibility, is the better choice. 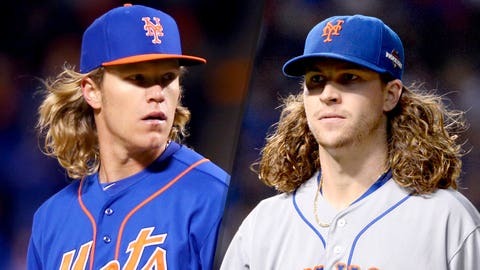 DeGrom in games 1 and 5 plus 7 in relief, Syndergaard in games 2 and 6, and Harvey in 3 and 7 is the winning combination for me. Let’s hope I’m wrong, LGMers.